There are several things that I bought for Roscoe during my pregnancy that I have felt compelled to also buy for Little Sears. The desire to be "fair" to both kids seems inherent, already. Actually, you know how much I love product and gear, and when I find something I love I have to share it. Who better to share it with than my other kiddos? Tiny Sprouts is one of my favorite small companies, and one you may already be familiar with. 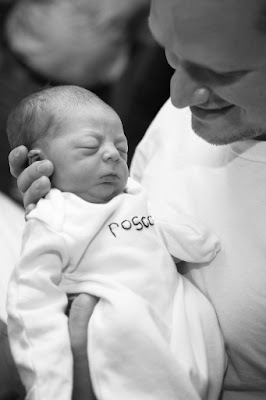 For Roscoe we purchased a growth chart and when there was a tiny little bump in the shipping process Tracey gave us a newborn gown embroidered with his name. It was his first outfit after birth, and it was way too big. 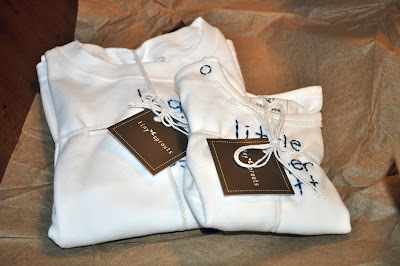 I've been prowling the Tiny Sprouts site for months, and finally ended up choosing a "big brother roscoe" shirt and a "little brother x" onesie with mitten cuffs. Today they arrived!!! I wish I could show you just how tiny and sweet the onesie is, but it would reveal little brother's name (I guess you get a small hint, anyway). Do you think this is just the start of matching outfits for these two because I have to admit, it is kinda fun. At the top of my wish list is the embroidered hand prints, and as soon as Little Sears is born those teeny tiny hands are going to be traced (as well as Roscoe's) and sent off for their first piece of brotherly artwork. Ooooh! So cute and tiny! Doesn't looking at Roscoe's newborn photos make you soooo excited to hold the new teeny tiny baby?! That's a great webiste. I marked it as one of my favs. Hmmm.I wonder what baby brother's name is...Garett? Brett? Rhett? Close??? Hmmmm, I underestimated my readers' ability to sleuth out a name!! Good guesses Mama--Rhett is cool, although a Roscoe and Rhett would be comical. :) None are THE name, but I like your picks. Cute! I love Roscoe's little face when he was brand new! Chett! Is it? Oooh, I like it if that's right! Oh, Roscoe is so little in that picture, I miss those days! The shirts are adorable... I'm guessing... Emmett? I have been looking into outfits just like that for B & his little brother; those are too cute!! I'm also going to throw in a name guess...Wyatt? Matching PJs are the best! These are all great names!! And definitely in the same vein as our final pick. Roscoe and Wyatt would make a good pair. Chett is pretty cool and really close to a nickname that we like for Little Sears's official name. I want to guess but seriously, I ALREADY KNOW! Plus, I can't really think of any double T names. ;-) I REALLY like the Chett guess though, it's cute!